The Temple Chamber of Commerce presented the first L.I.V.E. 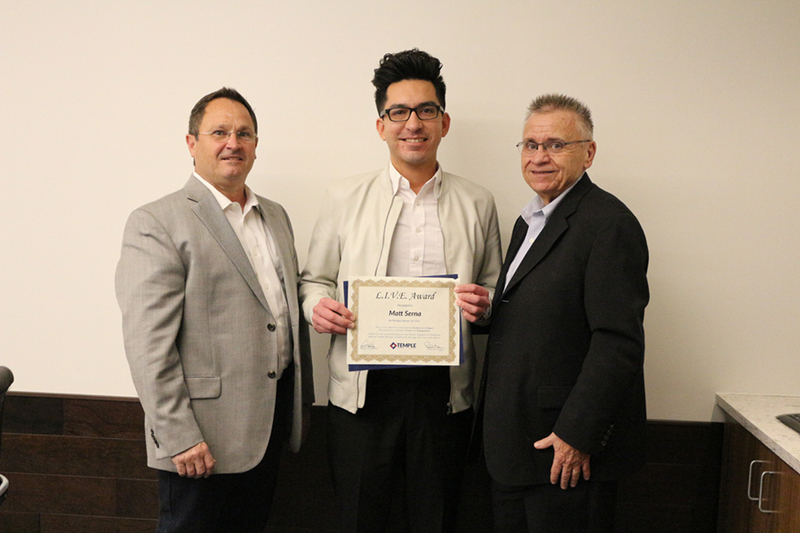 Award to Matthew Serna on February 28, 2019 at the Santa Fe Business Center. The L.I.V.E. Award is given to Leaders who Impact the community through Vision and Engagement. It was created after Dr. Tony Evans charged the Temple community to contribute purposefulness to their existence during the 2019 Salute to Business Banquet. Matthew is the 2019 Chair for the Red Carpet Ambassadors (RCA) and has won RCA of the Quarter on multiple occasions. The RCAs are present at every Chamber event volunteering their time and efforts to help the event run smoothly. From holding doors open and greeting attendees to holding the ribbon at Ribbon Cuttings, RCAs are always present in their red jackets. He was recently recognized by the Restaurant Management Company of Wichita, Kansas DBA Pizza Hut for three different awards at their annual banquet. Matthew was awarded the Restaurant General Manager of the Year 2018 and the Marketing Restaurant General Manager of the Year 2018. The Pizza Hut at 7150 W Adams was recognized for $1,000,000 annual sales in 2018. In order to qualify for these awards, it takes more than just selling pizza. Criteria includes; a great to outstanding status with the company, deep community involvement (i.e. Working outside of the store, and volunteering time and efforts at events), outstanding marketing ideas, an insight into area of operations, and being an outstanding representation and spokesperson for the brand. The Chamber hopes that the L.I.V.E. Award will help introduce and bring attention to those here in Temple who impact the community with purpose.